Closed entrance of the platform escalator at the 16th Street BART station. Photo by Courtney Quirin. 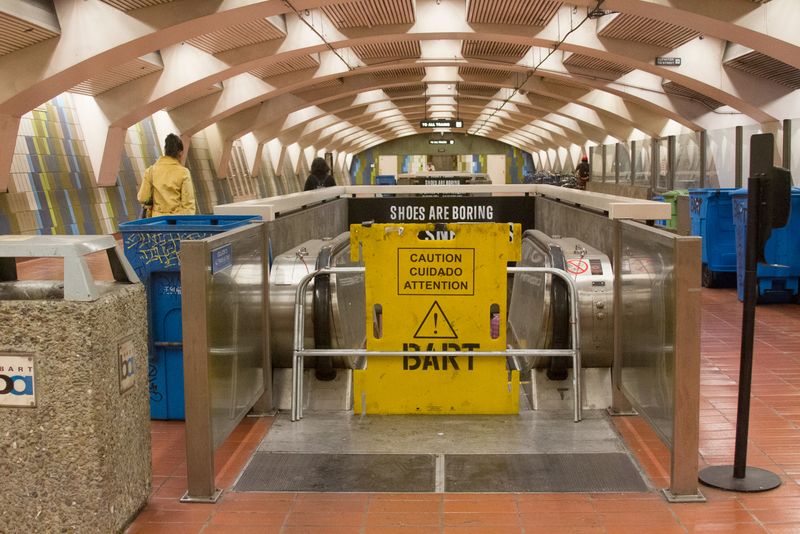 The escalators at the 16th Street BART station have gone bust again, but this time human excrement isn’t to blame for the 36 days and counting that the stairs have been stilled. Old age was the culprit, according to an email from Robert Cotton, BART’s power and mechanical section manager. The 40-something-year-old gearbox had leaky seals and was laid to rest on August 27. The escalator is scheduled to be resurrected on October 4. Like a transmission in a car — only bigger — the gearbox sits next to the motor under the “hood” of the escalator, where it controls the movement of gears with chains looped around them. 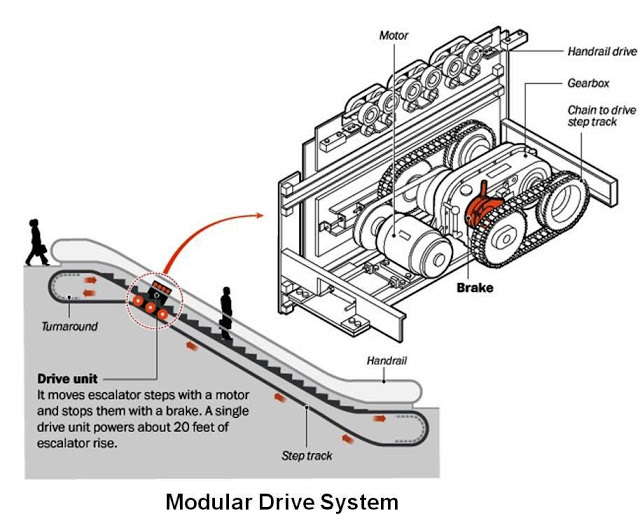 The motor turns the gears, which rotates the chains that in turn make the steps go round. And, similar to the transmission fluid needed to make a car switch gears, escalator gearboxes have seals and gaskets containing fluids that lubricate the gears to move the chains. Over time, leaky gearbox seals may destroy the gears, ultimately shutting down all movement. Lindsey Pettis, station agent of eight years who is one of the first to put in requests for maintenance, says escalator shutdowns that frequently plague BART can often be fixed in 30 minutes. Getting parts added to the delay. Cotton and his team have been waiting on rush-ordered parts and some special orders, which can take up to 10 weeks. In the meantime, Pettis will continue to be a daily sounding board as people shout out their escalator woes when darting towards the platform stairs, or take a moment to personally discuss the issue with him and file a complaint via BART’s comment cards that his supervisor picks up daily. “In the morning, when people are rushing to work and the escalator is out, that’s when we get tons of complaints,” Pettis says. It was never excrement. There’s no way there could be more feces in BART than are in NYC subway escalators and they don’t break down as often as BARTs do. The homeless aren’t using the escalators as bathrooms, especially not the interior escalators. Even if they were, opening the public bathrooms would help patrons who want to poop on the system that poops on them every day. Explain to me why the downtown subway stations smell like pee. You can always take the elevator/moving bathroom stall. Parts delay? Sure. When was the last time an escalator at Mary’s was down for 36 days? Lazy government worker incompetence, nothing more. If you mean Macy’s, those deathtraps are a big reason I avoid shopping there. They clearly haven’t put any maintenence into their stores since the 70’s at best. I hope everyone realizes–in the real (non-government) world, this kind of repair takes a day or two. And costs much less than BART will pay, whether done by its own “workers” or a contractor. If they bothered to clean & maintain the escalators, they wouldn’t break down so often. Also, it’s insane to run escalators designed for indoor use outdoors in the weather, without so much as a canopy to keep the rain off. I’ve been on lots of other cities’ subway systems, including in Europe, & none of them have unsheltered escalators. This has been a design defect since the system opened, yet they’ve never done anything about it.